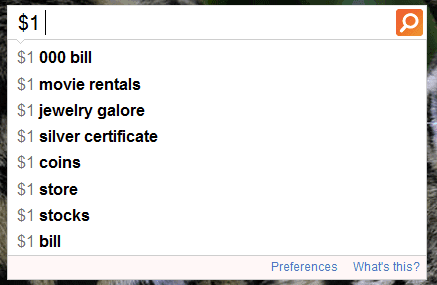 One of the most useful Google Suggest features missing from Google Instant was the Web History integration. Google Suggest used to show a list of previously typed searches if you were logged in to a Google account, so you could quickly select the query without having to type it again. 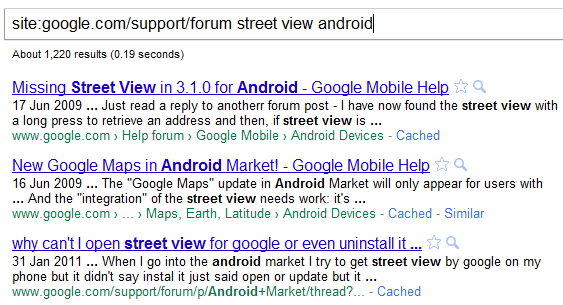 This feature is back in Google Instant and it hasn’t changed too much. You’ll still see up to 3 suggestions from your Web History, but the “Remove” link is more visible and personalized suggestions have a different color. Unfortunately, Google’s implementation is not great because it shows too many suggestions from your Web History and your previously typed searches are very likely to become predictions. 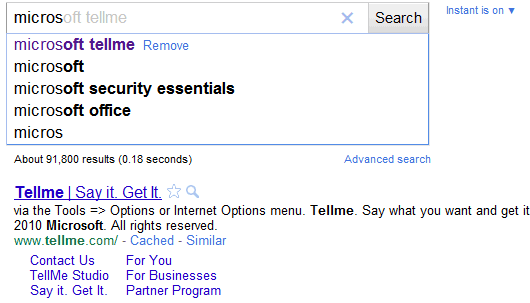 For example, if you’ve searched for [Microsoft Tellme] two days ago and you now start to type “micros”, Google will display the results for [Microsoft Tellme]. 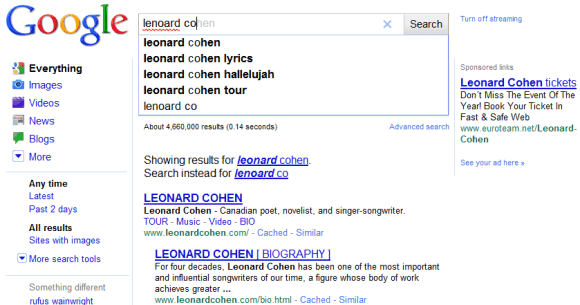 With Google Instant you get results as fast as you type, but your search doesn’t stop there. Once you get results back, you choose a site to visit based on the information in each result—like the title, a snippet of text and the URL. Over time we’ve made steady improvements to our search results and snippets to help you pick a great page. Now we’re making a leap to image-based snapshots—a new kind of visual search result we call “Instant Previews” which makes it even faster to choose the right result. 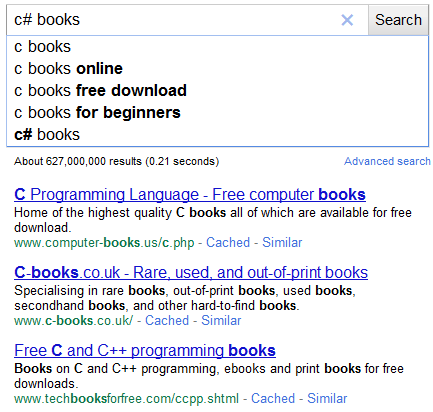 Quickly compare results – A visual comparison of search results helps you pick the one that’s right for you. Quickly flip through previews to see which page looks best. Pinpoint relevant content – Text call outs, in orange, will sometimes highlight where your search terms appear on the webpage so you can evaluate if it’s what you’re looking for. 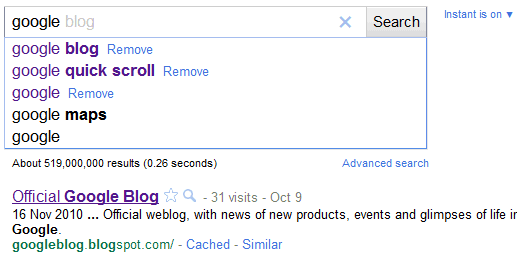 Interact with the results page – Page previews let you see the layout of a webpage before clicking the search result. Looking for a chart, picture, map or list? See if you can spot one in the preview. Instant Previews can be helpful for many kinds of tasks. For example, say you looked at a page before and need to find it again—with a preview, you can tell if any of the results look familiar. Or perhaps you’re looking for an official website—look for a logo and formal style and you’ll probably be able to identify it. Or maybe you’re looking for a how-to guide—it’s easy to spot a page with clear illustrations and step-by-step instructions. We realized early on that this kind of experience would only make sense if it was lightning fast. Not long ago simply downloading an image could take 20 or 30 seconds, and even today many websites take four or five seconds to load. With Instant Previews, we match your query with an index of the entire web, identify the relevant parts of each webpage, stitch them together and serve the resulting preview completely customized to your search—usually in under one-tenth of a second. Once you click the magnifying glass, we load previews for the other results in the background so you can flip through them without waiting. Well, I think that’s enough of a preview—soon you can try out the real thing for yourself! The new feature is rolling out now and should be available in more than 40 languages in the next few days. Update 6:50AM: We removed the YouTube video to update it. We’ll be back shortly.Update 4:35PM: Added updated YouTube video. Thanks for your patience! 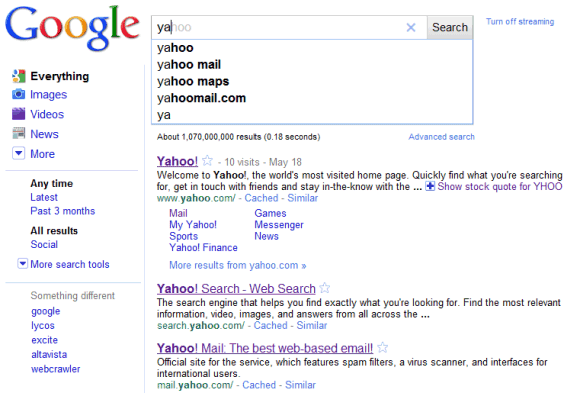 Google Instant makes search faster by displaying not just predictions but actual search results as you type. This saves valuable time on a desktop browser, but wouldn’t it be great to have Google Instant on mobile devices, where each keystroke and page load is much slower and you frequently have just a moment to find the information you need? In September we announced that we were working to bring Google Instant to mobile, and today we’re making a beta version available to most iPhone and Android devices in the U.S. To try it out, go to google.com in your phone’s browser and tap the Google Instant “Turn on” link beneath the search box (if you don’t see the “Turn on” link, try waiting a moment and then refresh the page). With Google Instant on mobile, we’re pushing the limits of mobile browsers and wireless networks. You will probably notice a big improvement in speed when you search thanks to a new AJAX and HTML5 implementation for mobile that dynamically updates the page with new results and eliminates the need to load a new page for each query. Google Instant for mobile works best on 3G and WiFi networks, but since the quality of any wireless connection can fluctuate, we’ve made it easy to enable or disable Google Instant without ever leaving the page. Just tap the “Turn on” or “Turn off” link. We hope you’ll enjoy using Google Instant for mobile as much as we enjoyed making it. It’s currently available for Android 2.2 (“Froyo”) devices and iPhones and iPods running iOS 4 in the U.S. in English. We’re working to support additional countries and languages and more devices in the coming months, so stay tuned. There are many missing features in Google Instant. The classic interface suggested searches from the Web History, so you could select previously typed queries. It seems that this feature will be available again. Google tests a version of Google Instant with Web History suggestions. 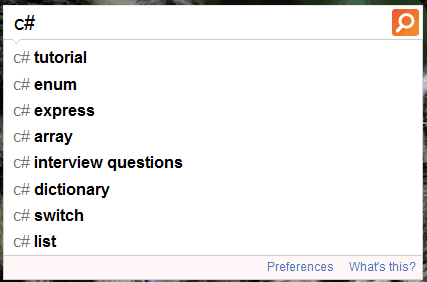 For some queries, 3 of the 4 suggestions are from the Web History and there’s only one general suggestion. Maybe it would be a better idea to only show one or two personalized suggestions, since they aren’t always useful.